Today's Friesian horse is the result of centuries of breeding and is native to the low lands of Europe, including Vlaanderen. In addition to the horses originally found in these parts, the horses of the Middle Eastern crusaders (including the Spanish stallions they confiscated during their wars) most probably contributed to the present type. 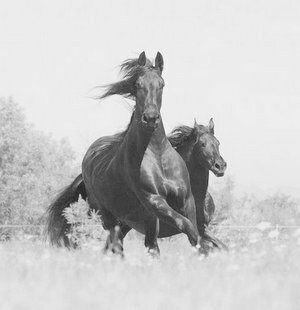 In literature, the Friesian horse has often been named a 'coldblood', but the term 'warmblood' would perhaps be more appropriate due to the 'warmblood' influence of the Eastern and Spanish stallions. The mother of the stallion Bars 1, the sire of the famous Orlow-race, was a Friesian mare. The Morganhorse breed was started with a Friesian stallion that time and there is even Friesian blood in the Shires. The Friesian Studbook was founded in 1879 and has always aimed to keep the blood pure by means of a closed Studbook. The determination of the board of the Studbook in the years 1944-1972 has been a great effort to pull the Friesian horse through these difficult times, and from that time onwards the race flourished as never before. Horses are now exported all over the world. 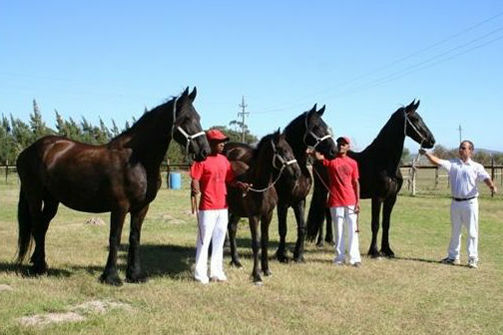 Most of the approved stallions are bred in the Netherlands, followed by the USA. The Friesian horse, with its baroque conformation, evokes memories of famous fieldmarshalls on horseback. Performances in the 4-in-hand shows have tradtionally been enjoyed by many people. The horse has striking features - uniformity in body structure, proud positioning of the head and neck, the stepping paces, and of course the beautiful colour and the long full tails, manes and fetlocks. 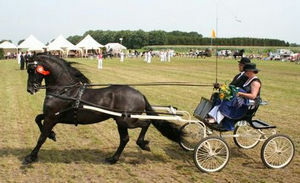 The Friesian horse is foremost a trotter and even today trotting events are held in Heereveen (Friesland). 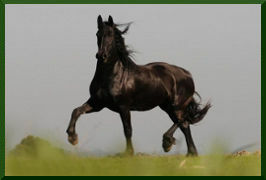 The canter does not come naturally to the Friesian although some horses manage it with ease. 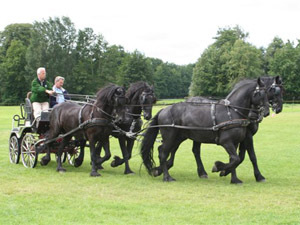 The Friesian driving horse is an even-tempered animal which behaves well in front of the carriage - it is often used for marriages and burial functions. As a riding horse, the Friesian also excels, with some stallions already in the high class dressage on the level of Prix de St George to Grand Prix. The Friesian was originally bred as a multi-purpose horse and has good temperament and knee-action. However, the great advantage of the Friesian, is that it can be used for many sport events including carriageshowing, handshowing, driving, riding and dressage. These days in Europe most of the Friesians are used for dressage, riding under the saddle and carriage driving. We are glad to announce that three generations of Starmares in South Africa are owned by the Friesch Paarden Centrum. Two of these Starmares are bred by us.